However, if were unaware, then you'll want start at the beginning, over on the 3GirlJam blog. Why, you ask? Because there are some really nice prizes for those who participate! Be sure to leave comments on all the participating blogs so that you'll be eligible to win. You don't want to miss out on this one! Prizes include a $15.00 gift certificate for the 3GJam blog and a $15.00 gift certificate to Pinque Peacock. Winners will be announced on Wed Dec 12th. Be sure to check the 3GirlJam blog to see if you won! The last stop on the hop is the 3GJ Challenge blog. The theme will be Christmas Inspirations- anything goes. If you have anything holiday related, take a moment to link up your project on the blog! There are going to be LOTS of great prizes. I decided to make a tag. I have seen several making their way on the scene and I thought I would join in the fun. This will probably attach itself to one of the knitting projects I am making for gifts this year. Ribbon: The wonderful ribbon is my favorite from the Summer Sprinkles ribbon from the Seasons Bundle. Those wonderful stick pins are new products from Pinque Peacock. These are really awesome handmade items that are unique and individual. You can't find these anywhere else! See an array of available pins HERE. The awesome little deer is from Unity Stamp Company set, "Mitten Weather Flourishes". The stamped snowflakes in the background (stamped in silver and white and embossed) and the "Let it Snow" are from another Unity set, "Mitten Weather Icons". Alot of the other embellishments (vintage buttons, linen thread, chunky glitter) are from Stampin Up! and Sizzix dies of various types. I also used my oh so favorite paint, "Blue Ice", from Creative Inspirations. The tag was painted with watercolor inks and topped with Mod Podge after the embossed snowflakes and white snowflake die cuts were added. For such a pretty little item, you should see the explosion of products that were all over my craft area when I finally completed it. And now I need to make a few more...but not until I have a chance to visit everyone's blogs! Well, that's it for me. Next up on the hop is OmaGloria's blog. I'm sure she will have something absolutely wonderful. I love tags and yours is beautiful. I love all the little details you added. This is absolutely beautiful! I love the layering!! Oh my goodness...this is gorgeous. 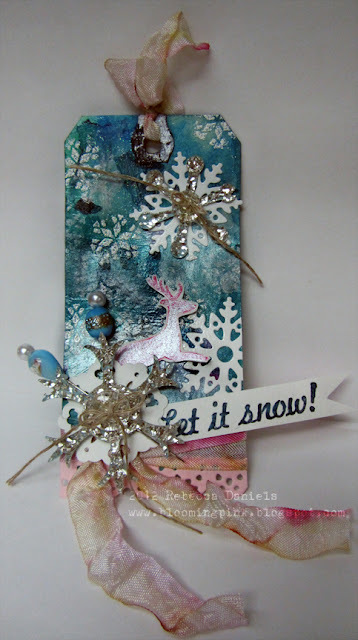 I love all the fun colors and you have done an exceptional job pairing up the snowflake with the pins. Beautiful Crinkle Ribbon tails, too. Wonderful tag. Someone will be super happy to receive this with their gift! Beautiful job on your tag. It's just stunning. Love the stick pins. Adds a great touch. Gorgeous tag!!! 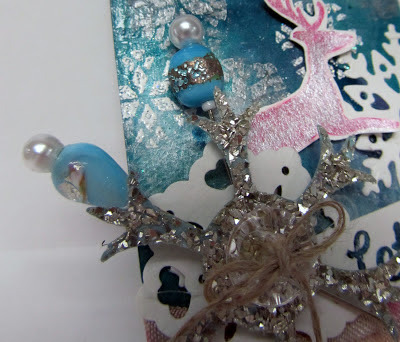 Love the inking, the snowflakes and that darling little reindeer!!! Beautiful tag! Stunning!!! Love the colors and techniques you used along with the ribbon and pins. Oh my, what a gorgeous tag! Love all of the little details that you added to make it perfect! Happy to be in the hop with you today!! Very nice. 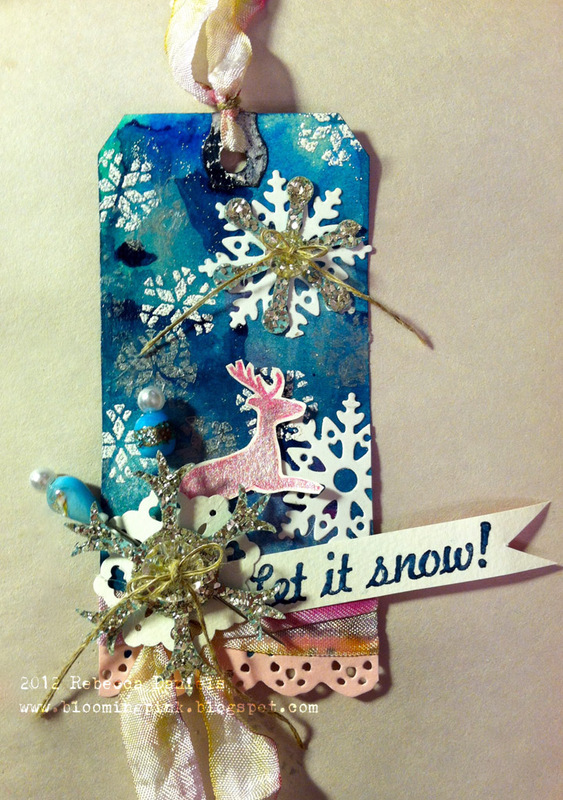 Love your inking on the tag and that snowflake with the stick pins is fabulous. This is stunning! Those stick pins are awesome! This tag is beautiful. Great job. BEAUTIFUL tag...I love the colors and details! such a gorgeous tag! beautiful! i love blue! Stunning tag !! How fun for Christmas ! This is beautiful!!! WOWZA such talent my friend. BAM, you nailed this. I ADORE this tag! I'm a Tim Holtz style wanna be! LOL Love, love, love this tag! Thanks for sharing your creativity! That is a seriously beautiful tag. I love blues and snowflakes. Your tag is so pretty. Love blue and white. GORGEOUS tag and LOVE the way you embellished it! Beautiful colors-AMAZING!! Looks fabulous! Love those stick pins!! The amount of detail on this tag is pretty damn awesome. All that embossing came out beautifully! Great attention to details. Beautiful tag. Beautiful tag! The snowflakes are wonderful. WOW WOW WOW!! I LOVE your gorgeous tag!! Totally Tim inspired and fab!! Rebecca- your tag is absolutely gorgeous! You knocked this out of the park! oooh i LOVE this tag! just beautiful! Wow, what a lovely tag! The glitter, the ribbon, and I love the stick pins! Thanks for the inspiration! That's a beautiful tag. So wintery. I'm your latest follower. Hope you'll follow on my blog too. I'm an American living in Ukraine where I do/teach arts and crafts. So fun. What a beautiful and snowy tag!! Stunning! That is such a beautiful snowflake. Love all the sparkle. what a lovely tag! someone is going to be a very lucky person when they receive that. the stick pins...I'm seeing those all over now and they're so pretty! TFS! This is one super amazing tag! Gosh, I just can stop finding elements to gawk at. I love the slightly tarnished tinsel on the flakes, and the stick pins blow me away! This is such a gorgeous tag. I love it!! What a beautiful tag! I love all the colors!